Part two of John Bunyan’s book Pilgrim’s Progress describes the pilgrimage of Christian’s wife, Christiania, their four sons, and the maiden neighbour Mercy. After her conversion, Christiania comes across a man with a muckrake who could only look down at the ground. Someone was holding a cælestial crown above his head, offering to give him the crown in exchange for the muckrake. 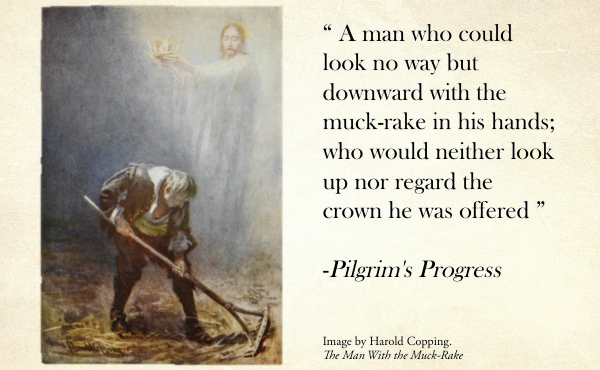 But the man did not look up or notice the crown; instead, he moved around the muck at his feet being careful to rake out the bits of straw and small sticks. The church commemorates the ascension of the Lord Jesus Christ on the 40th day after Easter Because Christ, with whom we, by faith, have been raised, is in heaven, we need to look away from the earthly things and seek the heavenly things. In 1 John 2:16,17, John said: “For everything in the world–the cravings of sinful man, the lust of his eyes and the boasting of what he has and does–comes not from the Father but from the world. The world and its desires pass away, but the man who does the will of God lives forever”.